South America 2012: Hasta la vista. Hasta que nos volvamos a encontrar en Quito. 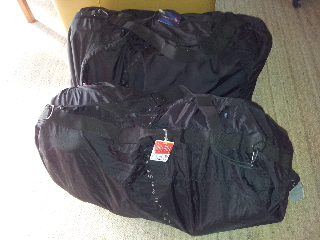 Packs locked into travel bags, out going passenger card done, and list checked. Will we get any sleep considering we have to be up at 2am? Just a quick note to wish you enjoyable travels in South America. We're sure you'll enjoy all the new sights and sounds and return with lots of memories and heaps of photos! Wish we were with you, but we're there in spirit via your blog. Tienen un buen viaje y caminatas seguros.